The New Year is here, and that means I’ll be fighting for time on the treadmill all of January when a slew of new ‘gym rats’ buy memberships to fulfill their resolutions. At least most of them will be gone by February! While most people make resolutions to become healthier, fitter, happier, more balanced etc… I try to avoid the R word; this year I have decided to make a bucket list instead. I am already pretty healthy and fit, though there’s always improvements in that category, and going to the gym is not a chore for me so I don’t really need any work in that department. The great thing about this bucket list is that more than half of it is requires me to stay fit in order to participate, so by default I will have more motivation to workout, thus staying healthy. Good luck to all of those who did make New Year’s Resolutions; I hope 2013 is your best year yet! I have successfully completed Phase 1 of 7 from the New Rules of Lifting for Women, and as promised, here are my thoughts on the program thus far. Looking at the workout regimen, you’d think doing squats, dead lifts lunges, step-ups, push-ups, crunches, lat pull-downs and cable rows for 8 weeks would be easy. It would be, if you used the same variation and weights every single week. The goal of this program is to increase your weights/resistance each workout, or increase your reps if the weight increase is too high on a certain machine to attain in one week. By the end of the 8 weeks, I could do each exercise at a higher weight or higher repetition (or both, in some cases) and I can definitely see more muscle definition in my arms, shoulders, back and legs. I can feel my core getting stronger as well. I must admit, phase 1 of the program is not very exciting. Once you’ve done it for two weeks, the exercises become mundane and it’s hard to find motivation to go to the gym to do the exact same workouts over and over again two times a week, for eight weeks. The excitement comes from being able to use a heavier dumbbell, crunching out an extra few reps or finally being able to increase resistance on the cable machines – but I think some people would lose interest in this very quickly if they weren’t already fitness fanatics. Looking back through the book, I noticed I completed stage 1 slightly incorrectly. Every week I continuously did 2 sets of 15 reps (even when I increased weights), when I was actually supposed to increase sets but decrease reps by the last two weeks of workouts. Meaning, week 7 and 8 I should have done 3 sets of 8 reps for each exercise for 24 total repetitions, meanwhile I was completing 2 sets of (at least) 15 reps for 30 total repetitions. It could explain while the last few weeks I struggled with the weights and felt like I was hitting a plateau. When I started this program, I was underweight, for where I wanted to be, because I’d lost muscle during my concussion recovery. 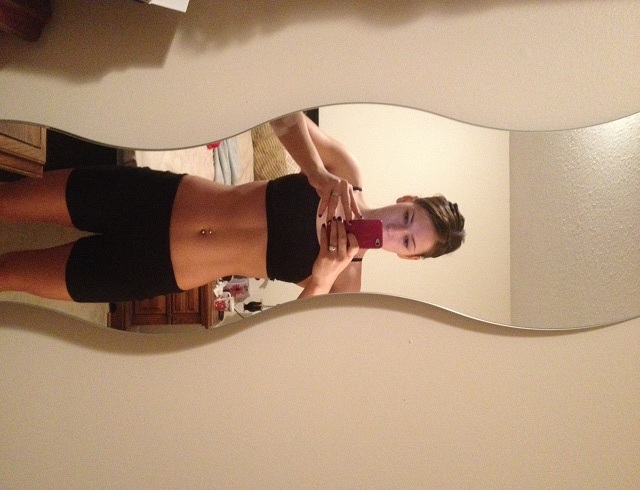 While I gained a few pounds and gained some inches back in some areas, I am still happy with my progress so far. I always seem to ‘bulk up’ a bit when I start a new lifting program, hence getting thicker in the thighs and waist. I also think part of that is muscle growth. Knowing I have more cardiovascular endurance, and more overall body strength, I am not disappointed by the weight or size gain. I am still wearing the same size pants (which are actually a bit too big). The end of Phase 1 saw me in a weekend hockey tournament, playing four hockey games in less than 40 hours. Add in the swimming I did in the hotel pool between games and you bet I was feeling delayed onset muscle soreness (DOMS) for a few days. The last two hockey tournaments I had been in prior to this one, I threw my lower lumbar out and felt my chronic knee pain. This tournament, I had neither issue sneak up on me, which leads me to believe the muscle I gained and/or strengthened protected my body from injury. I decided to take a week of recovery at the end of Phase 1 before beginning Phase 2, staying away from lifting weights, but still going to the gym to do cardiovascular activities and body weight exercises. Before I started this program, and after a few months of inactivity due to my concussion, it took me 17 minutes to run 1.5 miles. By the end of Phase 1, I can now run 1.5 miles in 13 minutes and 45 seconds. My next goal is to be able to run 1.5 miles in less than 12 minute. One of my goals for the New Year is to run a 5 km race for a charity – on Thursday I managed to run just over 5 km in 40 minutes so my new goal is to work on shortening that time. Phase 2 begins on tonight. **Update 09.05.2013** Half way through phase 3 of the program I sustained whiplash, torn muscles in my shoulders/back/lats and minor back pain after being in a motor vehicle accident – I was hit from behind. The accident happened on March 18 and I am only just getting back into the gym on May 7 to start “muscle setting”. I am allowed to do the motion of the workouts, using the cables, but I am not allowed to use weight just yet. Talk about putting a damper on my progress since the concussion in June. I will have to re start the New Rules of Lifting for Women once I am 100% cleared for lifting again. After a few months hiatus from my blog between moving, starting two new jobs, a concussion and wedding planning, I am ready to update you. I sustained a concussion back in June while playing summer hockey (not competitive hockey either) when I crashed into the end boards after scoring a goal. I suffered from post-concussion symptoms for over three months, had to miss two full weeks of work from my part time job and another one and a half weeks from my full time job. Only three weeks ago was I able to get back on the ice for the first time; since I was trying to find a winter team to play on and that was when they had their tryout. I wasn’t supposed to get back onto the ice that quickly, without first spending weeks in the gym getting closer to being allowed to participate in a non contact practice. I attended an exhibition game and only managed to play three shifts in the first period before hanging up my skates because the headaches and dizziness were coming back. A week later, a second team had their last tryout so I had to get back on the ice again so this other coach could see me skate. I managed to participate in 35 minutes of the drills and another 15 minutes of scrimmaging before I decided to leave that practice early too. After that tryout, I felt some of the post-concussion symptoms for a few days and once they were gone I went to the gym for a cardio session on the elliptical. I was asked to attend a rec level exhibition game a few days later, so another coach could see me skate, which was my first full game back. I had a bit of a headache and some dizziness right after, but it went away within the hour and didn’t come back. The next day I went to an Intermediate A tryout, which was a full out practice. I haven’t had a full practice in over 4 years, let alone 3 months following a concussion and no gym time, so I didn’t expect it to go over very well. I had to take a break halfway through the skate for 10 minutes, and had a bit of a headache afterwards again that went away within the hour. This past week I managed to get to the gym, finally, on Wednesday after feeling a little under the weather. It was my first huge workout since sustaining the concussion. I ran 1.6 miles in 18 minutes followed by 30 minutes of strength training, including push-ups, lunges, squats, planks, crunches, bench presses, dips and pull-ups. 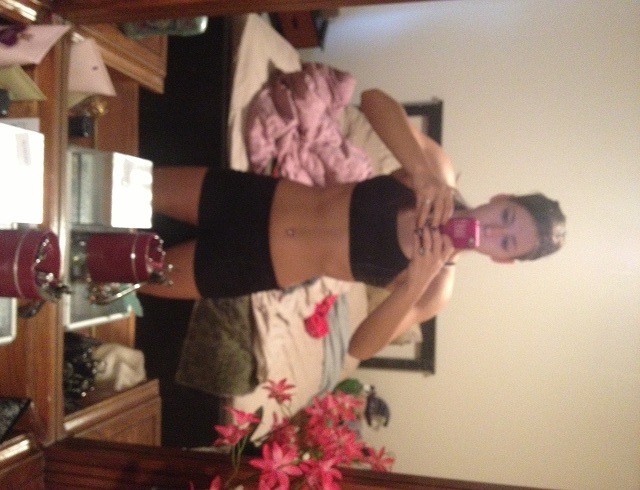 I felt AMAZING after the workout and wanted to spend another hour working out but knew I shouldn’t push it. Sunday I was back on the ice again for a second skate with the Intermediate A team and it was awesome! I had no dizziness and no headaches throughout the practice, including after taking a huge collision with another player on the ice. Now I am ready to get back into the best shape of my life so I can have a great hockey season while preparing for ball hockey in the summer. Tonight I will be starting the 6 month workout program in the New Rules of Lifting for Women. I will be blogging about the program along the way, including some before and after photos with updates after each stage of the program. I am doing this program to regain the muscle I lost and then some, and improve my hockey game. 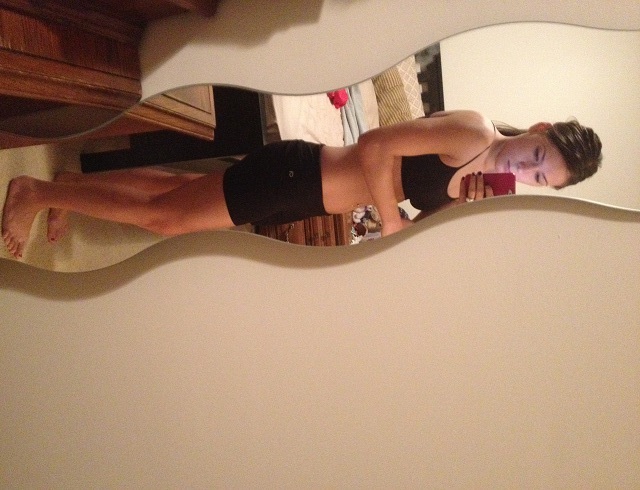 Weight loss is not the ultimate goal; I should actually gain some weight with the added muscle. Here are “before” photos that I took this morning upon waking up: A front profile view and a side profile view, showing the obliques and my calf muscles. Upon completion of stage 1 of the workout program (takes about 6-8 weeks to complete) I will post a blog with updated photos. I apologize to all my readers who were expecting content on the Montreal Canadiens, but with the season locked out, I had to find something else to write about. I hope you find my journey through this program just as interesting! Seven weeks ago I moved to Ottawa and joined a women’s competitive ball hockey league for the first time. I caught the ball hockey bug last fall when I was asked to sub in a tournament and decided to try it out since I figured it couldn’t be much different than ice hockey. Well, turns out ball hockey is quite different from ice hockey…from a floating blue line (gets kind of confusing when you play two ball hockey games a week then go play ice hockey and have to switch back to the non floating blue line offside rule), to not being able to glide when you’re tired, to trying to handle a rolling, bouncy ball instead of a puck. I never thought I’d enjoy a sport more than ice hockey, but it seems I’ve found the one! I am absolutely in love with ball hockey and the amazing cardio workout that it is! I’m dripping with sweat by the time the 2 minute warm up is done. I’ve also noticed my puck handling skills have gotten a bit better (or maybe I gained more confidence with the puck) after trying to control that orange ball. The Ottawa Vanier Women’s Ball Hockey League that I am currently playing in is one of the best league’s in Ontario, if not Canada, for competitive ball hockey. More than 1/3 of the 2011 Canadian women’s national ball hockey team was made up of players from the OVWBHL. From what I’ve learned from other players, this is a scouting year for the national team. The scouts that attend our games choose the Ottawa team that goes to Nationals (which is in Edmonton this year) and while at Nationals the scouts from the Canadian Ball Hockey Association (CBHA) look at players to put on the team that goes to the World Ball Hockey Championships. Since I can’t see myself making the CWHL, what with them folding one of the teams to make the league even more elite now, and especially not a national ice hockey team, my new goal is to make the Ottawa team that goes to Nationals and one day wear the maple leaf at the World Ball Hockey Championships. Currently I have five points in seven games, and I’m the second highest goal scorer on my team, but I still have to get better; I am ranked 42 among 229 players in the league. Knowing this is my first whack at ball hockey, I’m not too concerned with my stats being ‘so low’ as long as I play positioning well, dig hard in the corners and move the ball quickly. Last week I scored a breakaway goal against the best team in the league, our team’s only goal in a 9-1 loss and I’ve had a high ever since. It was my first time actually scoring on a breakaway in ball hockey, after a failed attempt in each of my previous games. I’m a really quick runner, but it’s been hard getting used to controlling the ball, so while I’ve been sent off on a breakaway in almost all of our games it was a great feeling to finally score on a break AND against the team that pummeled us…hopefully the scouts were watching! By now you’ve already heard the news that defenceman Hal Gill has been traded to the Nashville Predators along with a conditional fifth round draft pick in 2013 in exchange for forwards Blake Geoffrion and Robert Slaney, as well as a second round draft pick in 2012. My initial reaction was sadness and a puzzled look on my face, never having heard of the two forwards the Canadiens acquired (okay, maybe I live under a rock sometimes). After some quick research and more thought, I couldn’t be more thrilled. With Gill being an unrestricted free agent, it was only a matter of time before something had to happen with him. As my step dad predicted last week, he was traded. It makes sense, seeing as we either would have lost him for no return or would have had to shell out the big bucks to keep him in town. In return we pick up two young forwards who are 6’2″; one whom bleeds bleu-blanc-rouge and has Bernie “Boom-Boom” Geoffrion and Howie Morenz running through his veins, the other is a good Canadian boy. According to the current roster on Canadiens.com, 19 of 25 players listed are over 6’0″ and 15 of them weigh in at 200 pounds or more. For a team that’s been criticized for lacking in size all season long, those are certainly big numbers. With only seven players over the age of 30 on the Habs roster, it’s looks like the beginning of a great future in Montreal. Okay, here’s the part where the girly hockey fan in me shines through so close your eyes for two seconds boys. By adding Gill to their line up, the Preds continue to bolster their roster of “sexiest NHL players.” To be fair, we still have a number of stunners on our team a la Josh Gorges, Carey Price and Max Pacioretty to name a few. Okay, girl comments are done, you can start reading again guys. Slaney has split the season between the AHL and the ECHL. He has one assist in nine AHL games, and eight goals and five assists in 23 ECHL games. A veteran defenceman with a wealth of playoff experience, strong penalty-killing ability and depth. 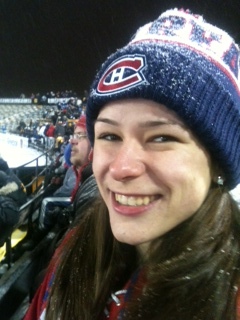 As sad as I still am to see Big Hal depart for Nashville, I am excited for the future generation of Montreal Canadiens. They may not be having the best season this year, but neither were the Ottawa Senators last year and look at them now. This time, I’d like to give PG a pat on the back for a good trade. 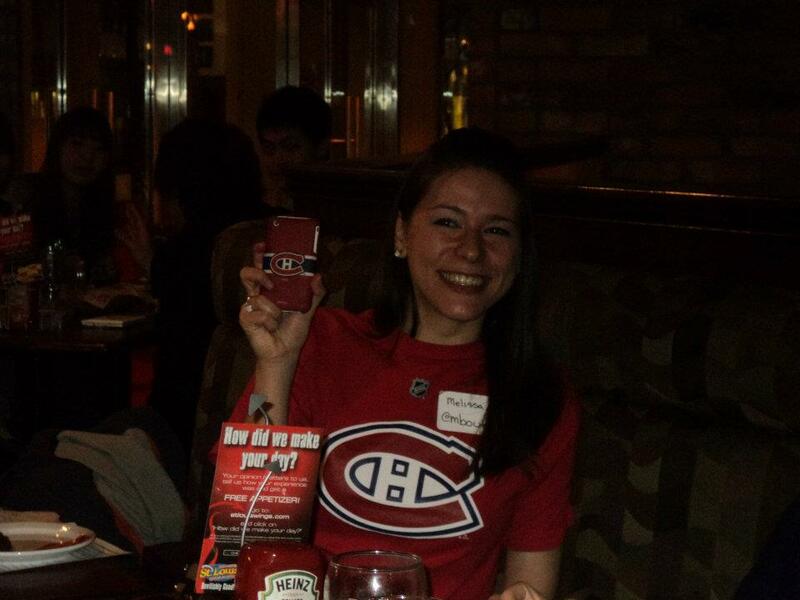 On Feb. 11 the All Habs Tweetup crew hosted a Toronto event at St. Louis Bar and Grill for a Hockey Day in Canada match up between the Montreal Canadiens and the Toronto Maple Leafs. 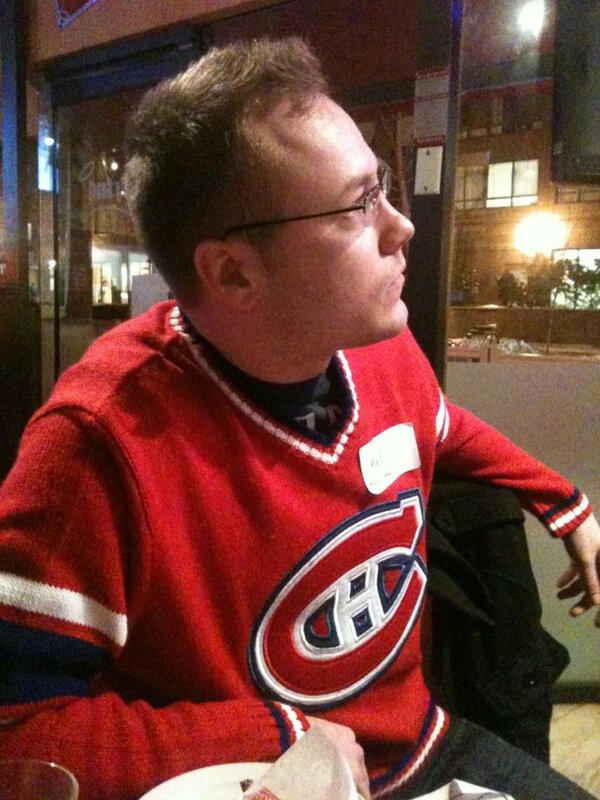 During the last year I’ve been reading up on these tweetup events and the friendships that come out of meeting fellow twitter Habs fans face-to-face, and finally had the opportunity to attend one myself. 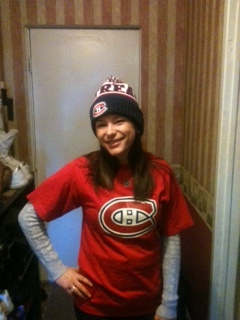 My fiance wearing my step dad's Canadiens sweater. I couldn't resist taking a photo for all his Sens fans friends back home. my bleu, blanc, rouge outfits to sport to the bar (I went with a Josh Gorges t-shirt), and raiding my step dad’s closet to give my Sens fan fiance a sweater to wear, we were on our way to show our colours in enemy territory. Luckily for me, Les Canadiens not only won, they completely dominated the blue and white in their home arena and shut them out on a night they were celebrating their beloved ex captain Mats Sundin. From the moment I walked into the bar, I knew it was going to be a great night. We were welcomed with open arms by my Twitter acquaintances whom I’ve built online relationships with throughout the last year or two. I finally got to meet @habbykins, @Kuyaz and @cokeaddict who I’ve spent a lot of time chatting with on Twitter about the Habs, my own hockey endeavours, and not to mention cake. Mmm, cake. Michael Kuyaz and I meeting in person for the first time! 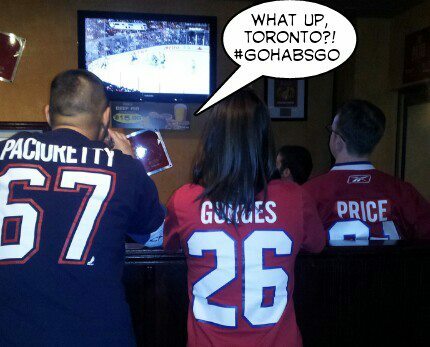 I'm wearing a Gorges t-shirt, he's wearing Pacioretty! I also met @thetonyjones and new follower @ange_ducharme, among others. When Erik Cole scored five minutes into the second period to give Montreal a 1-0 lead, the entire bar (okay, our entire group…which made up 3/4 of the bar) errupted in cheers as @Kuyaz came around and gave everyone a high five. The blue and white crowd at St. Louis would remain silent for the rest of the game as the Habs went on to rout the Leafs 5-0 just hours after Sundin claimed Toronto was the hockey capital of the world, in his pre game speech. So much for that, eh Mats? The Canadiens chased James Reimer out of the net after 40 minutes of play, after he allowed four goals on just 15 shots. Jonas Gustavsson replaced “Reim Time” between the pipes for the third period and was beat once on three attempts. Carey Price made 32 saves for a perfect game, as Montreal won their fourth straight. It was the first shutout by the Canadiens in Toronto since Jose Theodore blanked the Leafs 4-0 on Oct. 11, 2003. The Canadiens league-leading penalty kill was tested five times, while they’re power play (which is second worst in the league) was 1-for-2. On each table was a piece of paper that included feedback on the event and a short quiz about Hockey Day in Canada. Needless to say, I didn’t know a single answer on the test but wound of winning a prize, $25 St. Louis gift card, for ‘most creative answers’. When Lars Eller dangled Dion Phaneuf and undressed Reimer for the Habs fourth goal, we were pretty sure the Leafs would not be able to come back into the game in the third period. During the second intermission our group sang happy birthday for former Montrealer Jaroslav Spacek, who was celebrating his 38th birthday. There’s a video recording of it somewhere, you’ll have to ask @cokeaddict for it. After filling up on nachos, wings, delicious drinks and plenty of high fives, hugs and photos the night came to an end and it was time to part ways. A big thank you to @Kuyaz and @Cokeaddict for putting on a fabulous event. I can’t wait for the next one! Next on my bucket list is to attend a Tweetup in Montreal. I’ve been to a lot of live hockey games in my life: NHL, AHL, OHL, NWHL, CWHL, University etc… but I had never experience an outdoor game before, until this past weekend. 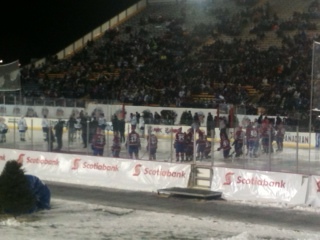 With the AHL Outdoor Classic taking place less than 100 km from my house, in Hamilton, I jumped at the chance to watch future NHL stars duke it out, outdoors, in the middle of January. Everything about the entire experience, from purchasing tickets to the final buzzer, was above my expectations. I purchased my tickets online, where I was able to pick my seats from the section, to the aisle to the exact seat numbers I wanted. (In the end I wound up sitting two rows, in the same seat numbers, in front of fellow Tweeter @thirtyonesaves). The ticket prices were outstanding, $80 per person, for great seats AND that deal came with tickets to the PepsiCo Outdoor NHL Alumni Game Friday night between the Montreal Canadiens and Toronto Maple Leafs and tickets for the AHL Outdoor Classic Saturday afternoon with the Hamilton Bulldogs hosting the Toronto Marlies at Ivor Wynne Stadium. In the days leading up to the event I was a bit apprehensive because of the strange weather we’ve been getting around here lately, but it turned out to be the most beautiful weekend possible for outdoor hockey! I had never been to an NHL Alumni game before either and wasn’t sure what to except from ex NHLers, especially when some people on Twitter said they’d never waste money on that, but I was actually blown away. Sure, it was much slower than an NHL game but damn, most of those guys can still outplay me, that’s for sure! Cujo was absolutely brilliant for the Leafs, some fans even went as far as to say he played better in the outdoor game than he did his last few seasons in the NHL! During the second half of the NHL Alumni Game, Kraig Nienhuis left the Leafs bench and climbed on stage, in full equipment, to rock the crowd with his rendition of Neil Diamond’s Sweet Caroline. 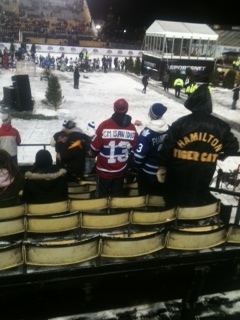 He wound up playing the tune again on Saturday for the record-setting crowd of 20, 565 fans at the AHL Outdoor Classic. Before the game and between periods the ex NHL players signed autographs for fans waiting along the pathway to the dressing rooms. It was funny how OLD some of those guys look now! 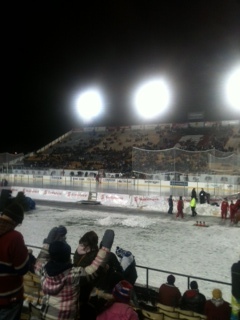 It wouldn't be an outdoor hockey game in Canada in January without a little snow. The weather forecasters called for snow flurries at 9 p.m. and low and behold they were actually right, as flurries started coming down at 8:56, delighting the snow flake loving kid in me. What I loved the most about this setting was how friendly the fans were – Habs and Leafs fans alike. I was surrounded by Leafs fans and they chimed a few cracks at me here and there but they took the comebacks in great stride. There were even a few people sporting Boston Bruins apparel -puke- that I was joking around with. Normally the animosity between these fan bases is pretty high in other settings, so it was a welcoming surprise to share some good laughs with them. 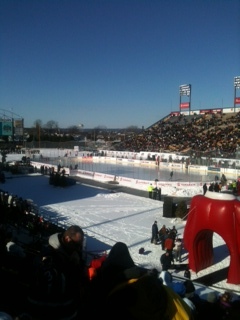 I couldn’t have asked for more picture-perfect weather for Saturday’s AHL game. The sun was shining and there wasn’t a cloud in the sky. Hamilton came out flying, scoring less than 30 seconds in the game which led to an ensuing fight (which Hamilton won). Unfortunately, the Bulldogs went on to lose 7-2. The crowd kept cheering until the end though, not like the boos you would typically hear ringing through the Bell Centre. If you didn’t have a chance to watch the live feed on Sportsnet, here is the game in six minutes from the NHL Videocenter. 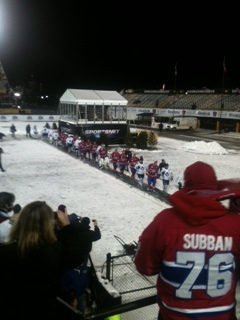 You can find more photos of the game on the Facebook Page for the 2012 AHL Outdoor Classic presented by Molson. Overall, it was a great experience that I would do over in a heart beat (although, I can’t see myself paying the $200+ ticket price for the NHL Outdoor Classic). This guy made my night! 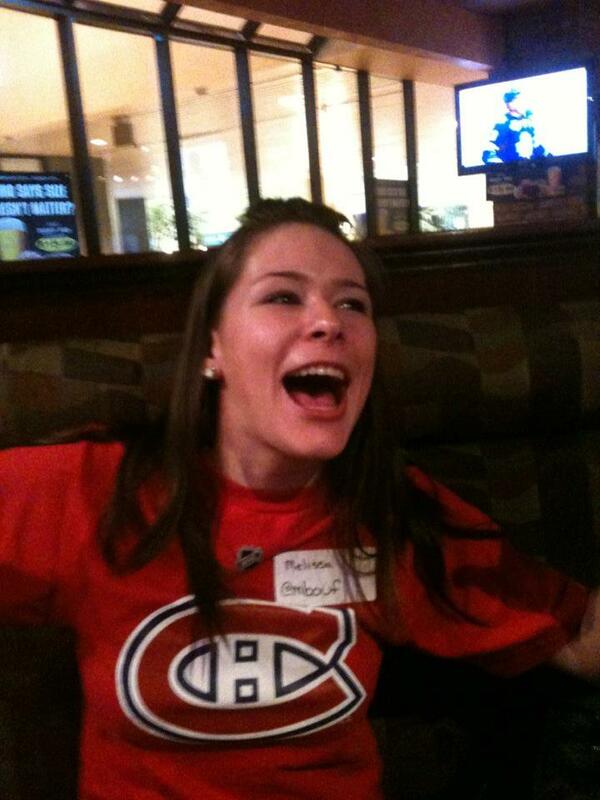 At Friday’s game there was a Habs fan sitting in front of us with a Cammalleri jersey on. He had taped over the name bar and wrote “GM is an idiot”. I wound up posting the picture to Twitter and it was still getting retweets more than 24 hours later. During the NHL Alumni game, one of the Hamilton announcers interviewed George Laraque at the Montreal bench regarding the coach, Guy Lafleur. After telling the reporter what a great coach Guy was behind the bench, he threw a little jab at the Quebecois media with a sly grin on his face. The entire stadium roared with laughter and the play-by-play announcers had a field day! Oh, George…you funny man, you. Here are a few other photos I took with my iPhone…sorry for the quality. 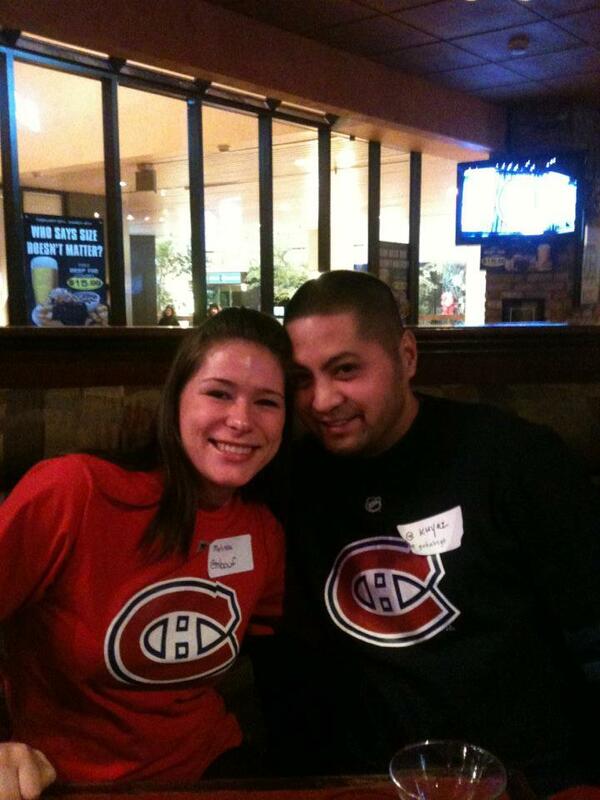 Bleed Bleu, Blanc, Rouge BBBR – Great commentary from a Habs fan of 20 years.